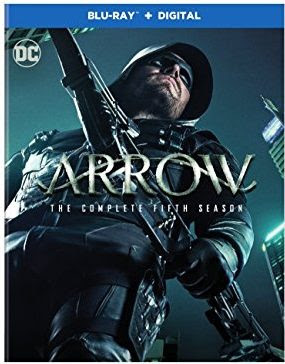 Article first published as Blu-ray Review: 'Arrow - The Complete Fifth Season' on Blogcritics. The fifth season of the CW’s Arrow comes with much anticipation for long-time viewers, and it’s now available to own. Beginning shortly after the death of Laurel Lance, fans know we will get to see Oliver tested. We’re not sure if he will try to rebuild a new team or fall back to his bad habit of shutting people out. In these twenty-three episodes, we get into the makeup of the lead character, and see how he has matured in the way he deals with events. Oliver (Stephen Amell) has changed over the years. He doesn’t deal with setbacks the same way he used to, showing that growth arc. It was not long ago that Oliver had to be convinced not to be a lone wolf. He has now matured. The Complete Fifth Season brings that to glorious fruition as he adds four new members to his vigilante squad. (Later, four becomes five with the inclusion of Dinah (Juliana Harkavy).) Oliver has to trust these people, let them in. And he can’t take years to get to know them the way he did with Diggle (David Ramsey) and Felicity (Emily Bett Rikards). Almost surprisingly, he does. That trust doesn’t come without its complications. Each of the four, Curtis (Echo Kellum), Rene (Rick Gonzalez), Evelyn (Madison McLaughlin), and Rory (Joe Dinicol), have their own pasts and demons. Two of them don’t make it through the season with the team. It doesn’t go smoothly for the others, either. There are a lot of added complications with these new characters, as well as subplots for them. They nicely expand the universe without taking away from the core of the show. What we see of Oliver expands, too, as he now spends his days as mayor of the city. Obviously, it isn’t easy for a superhero to also have such a demanding day job. Arrow doesn’t always handle the balance realistically, at times minimizing the time he spends in the office. But there are certain situations that get very interesting with Oliver’s dual role. It makes sense to include Thea (Willa Holland) and Quentin (Paul Blackthorne) in this thread. Adding Adrian Chase (Josh Segarra) to the mayor’s side of the story is a good decision, too. Although, ultimately, I wish they hadn’t gone the way the writers did with Chase. Not that I have a problem with what Chase represents, just that I wish it had been someone else. A big element of Arrow has long been flashbacks to his life during the five years he was missing, just prior to the series’ beginning. These usually end up dragging down the show, and so it’s great to know that The Complete Fifth Season contains the last of them. As fascinating as Anatoly (David Nykl), the main addition to these sequences this year, is, like in past years, Arrow spends too much time on this subplot. By halfway through, one is just waiting for it to end. Unfortunately, the conclusion, which was full of promise since it needed to connect to the pilot, didn’t land all that well. This is in stark contrast to the excellent ending of the main story. This season cleverly brings back a lot of characters from years past, many who died, and things are tied together satisfactorily. There is real emotional heft in these installments. I’m glad the show will continue, but this definitely feels like the end of a major chapter of Arrow. Arrow – The Complete Fifth Season comes with a slew of extras. One featurette focuses on the new team, appropriate and solid, and at about ten minutes, a good length. Another tackles the primary villain from this season, as it should. There is a gag reel and deleted scenes. I usually complain about including last year’s Comic Con panel instead of the most recent one. However, it works here because there are plenty of tidbits that aren’t just about this season. The final featurette concerns Arrow‘s 100th episode. This also happens to be the show’s contribution to a four-show crossover. In my opinion, this is the weak link in the event because much of it takes place in a fantasy world Oliver and friends are trapped in. This might have been appropriate for such a monumental episode of Arrow. Having to tie it into the crossover story waters it down. The result is something pretty disappointing. It’s easy to see why when you think about all the elements going into it. In all, though, this is a strong season of Arrow. There are great new characters, a few surprising twists, and a clear evolution of an aging series. Arrow – The Complete Fifth Season is available now.